A TXT (Text) record doesn't really do anything in itself, but can be used to relay information. For example SPF (Sender Policy Framework) information. 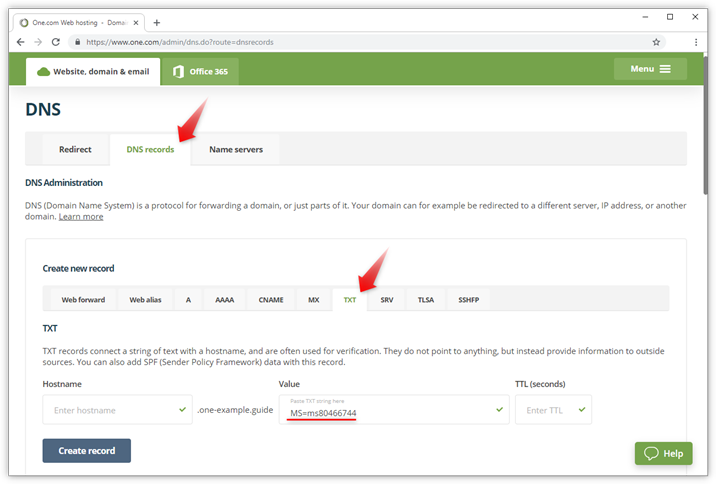 TXT records can also be used to verify that you are the owner of your domain, for example when you want to set up your domain with Office 365. Under create new record, click TXT. - Leave the hostname empty, or add a subdomain. - Enter the TXT string under Value. - Optionally enter a TTL, or leave it empty to default to 3600 seconds. Example: In the screenshot below we have added the TXT record MS=ms80466744 to verify that we own the domain one-example.guide. This is required to be able to continue setting up our domain with Office 365. The TTL is left empty, which will make it default to 3600.